Suitable for live use and recording. Easy to shape, edit and store presets. A little pricey for the feature set. 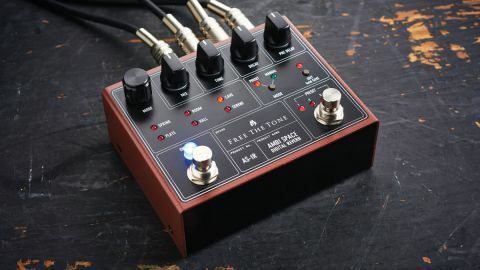 Given the quality of its overdrives, we were quite excited to try Free The Tone’s new high-end ’verb pedal. by preserving the dry analogue guitar tone unadulterated - the reverb signal is blended in on its way to the output/s by adjustment of the Mix knob. A Kill Dry switch in the back panel enables 100 per cent wet output, giving extra options for effects loops, recording/mixing and some super- spacey sound effects. Stereo inputs, switchable to instrument or line-level, along with a handy pair of stereo outputs, give the pedal further practical use for stage and studio. Manual controls are augmented by MIDI in, enabling remote bypass switching, choice of reverb Mode/algorithm type, adjustment of the Mix, Tone, Decay and Pre Delay parameters, plus selection of up to four presets. Handling twice the bit depth of a regular 16-bit music CD, the AS-1R has a really detailed and natural-sounding character. With some outstandingly musical reverb algorithms - namely Spring, Room, Cave, Plate, Hall and Serene - it’s not far off the quality of rackmount studio reverb units, albeit in the highly tweakable form of an effects pedal primarily aimed at guitarists. Although limited to six broad areas of tastefully dialled-in ambience, there’s plenty of sound sculpting to be had. Adjustment of the Tone control via a low- or high-cut either brightens or darkens the effect without being too harsh or muddy, while Decay adds interesting and reactive dynamics. The Pre Delay certainly adds a much needed realism and depth, although the purists among you may wish to turn it off in Spring mode (it does, however, produce a rather unexpectedly useful ducking-style effect!). If you want studio-quality reverb on - or indeed off - your pedalboard, then this pedal will satisfy. It’s going toe-to-toe with the likes of Strymon’s BigSky at this price, though, so you’ll need to want it for its build quality and superior sonics - as the feature set is relatively sparse for the price.